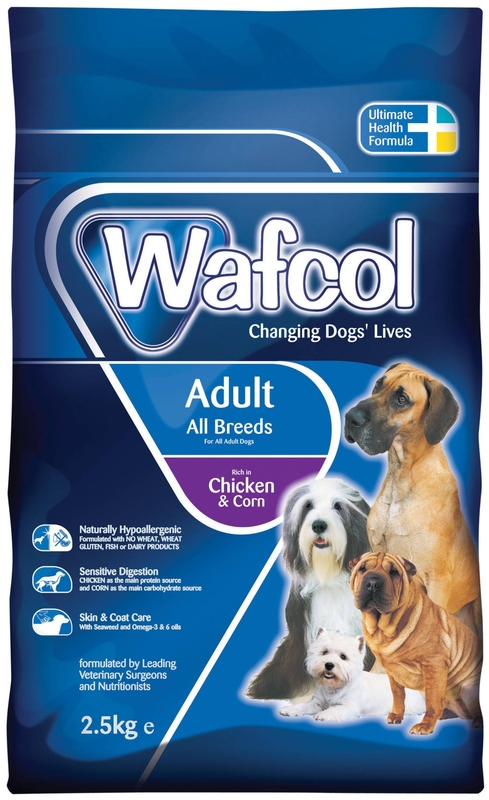 Wafcol Super Premium Adult is wholesome diet, specially formulated for adult dogs with food intolerances and digestive sensitivities. The diet contains a hearty blend of prebiotics, essential omega fatty acids and white meat proteins for the complete nourishment and protection of your dog, helping to promote health, vitality and happiness. To reduce the risk of exacerbating digestive sensitivities, allergies or internal discomfort the recipe contains no wheat, wheat gluten, oats, barley or rye, so you can be assured your dog is receiving the very best in dietary care. Omega fatty acids will enhance the condition of your dog's skin and coat, whilst corn will provide sustenance and energy and added seaweed will aid in the growth and repair of tissues. Teeth and bones will also be supported by specifically adapted levels of phosphorous and calcium. A great, nutritious and palatable diet to appeal to the most selective appetites. Maize (59%), Poultry Meal (21%), Soya, Soya Hulls, Seaweed (3.4%), Sunflower Oil, Poultry Digest, Minerals, Mannoligosaccharides (MOS 0.14%), Vitamins, Brewers Yeast. Maize (57%), Soya, Fish Meal (14%), Sunflower Oil, Seaweed (3.4%), Soya Hulls, Minerals, Mannoligosaccharides (MOS 0.14%), Vitamins, Brewers Yeast. Potato (34%), Salmon (24%), Salmon Meal (13%), Whole Lupin, Seaweed (6%), Sunflower Oil, Salmon Oil (2%), Salmon Digest (1.8%), Minerals, Vitamins, Mannan-Oligosaccharides (2150mg/kg), Fructo-Oligosaccharides (2150mg/kg), Glucosamine (340mg/kg), Methylsulfonylmethane (MSM 340mg/kg), Chondroitin (240mg/kg). Vitamins (kg): Vitamin A (as retinyl acetate) 23,148 iu, Vitamin D3 (as cholecalciferol) 1,852 iu, Vitamin E (as alpha tocopherol acetate) 69 mg. Trace Elements (kg): Zinc Chelate of Amino Acids Hydrate 308.64 mg, Zinc Sulphate Monohydrate 128.60 mg, Ferrous Sulphate Monohydrate 92.59 mg, Cupric Chelate of Amino Acids Hydrate 32.41 mg, Manganous Sulphate Monohydrate 30.86 mg, Cupric Sulphate Pentahydrate 12.96 mg, Calcium Iodate Anhydrous 3.03 mg, Sodium Selenite 0.21 mg.
Vitamins (kg):Vitamin A 14,867 iu, Vitamin D3 1000 iu, Vitamin E (as alpha tocopherol acetate) 111 iu. Below are some recent questions we've received regarding Wafcol Super Premium Adult Dog Food, including answers from our team. Is this dog food suitable for my dog, who has a yeast allergy? Thank you. No, this diet contains yeast (as a vitamin supplement). If you are sure your dog has a dietary allergy to yeast (which is very unusual) then this diet is not suitable.